← Here Comes Santa Claus: SantaCon SF! I was beginning to think my quest to find holiday-appropriate artwork was in vain until I stumbled onto the clever, humorous art of Ed Wheeler. A Philadelphia-based photographer, Wheeler has spent the last twenty-five years taking self-portraits of himself dressed as Santa and inserting them into classic, timeless works of art. His technique is amazing, as it’s hard to tell that the he’s not part of the original painting! Anyway, what more can I say, other than Santa really gets around! 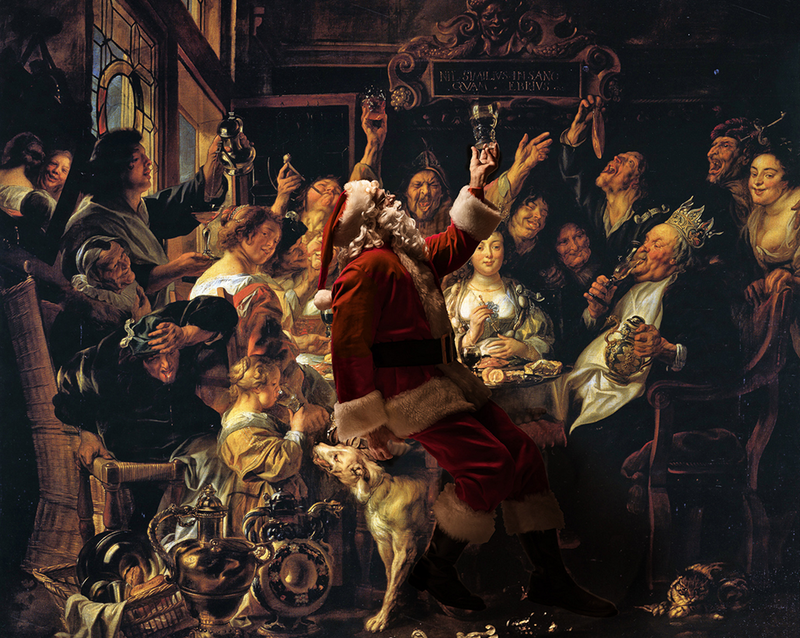 Whether it’s Renaissance, surreal, or neo-modern-post-impressionist-classical, Santa really knows his way around the art world! See more after the jump. This entry was posted in Art, Christmas, Holidaze, Weekly Art. Bookmark the permalink. Merry Christmas right back at ya, Jo!!! Glad you like this crazy collection! Hi Pat … I was hoping Santa would leave some of these underneath my tree, but no such luck. The least he could do is extend my credit line! Happy holidays to you and yours! I saw these on tumblr today! I found these on an art blog and I couldn’t resist sharing. Pretty cool stuff. hey there geeks. cool! glad you liked the! happy geeky holiday! HA! These are awesome. Santa playing poker with the dogs is my favorite. How awesome is that. I love it! Great post for some holiday cheer 🙂 Have a good one! Happy holidays, Guat!!! The poker-playing dogs are my fave too, but does it come in velvet? That’s cool Stephen. You’ve brought some smiles again. Merry Christmas! awesome … mission accomplished!!! happy holidays to you and yours, paula!!! Perfect! Love all of them! Feliz Navidad, Stephen. Gracias, Angeline!!! Hope your holidays are fun, peaceful and full of joy! Love the collection of Santa images — put such a smile on my face! Have a wonderful Christmas! Happy holidays, Danny! Glad I could help spread some holiday cheer! I love the Nighthawks. Merry Christmas, Stephen. A smile to your face? well then, mission accomplished.